The decision of excluding China from the Rim of the Pacific Exercise (RIMPAC) evolved into tense diplomatic relations among the countries located in the South China Sea. Former Secretary of Defence, James Mattis, warned that the exclusion of China from the military exercise represents a first step to encounter a militarisation process supported by the Chinese government in the South China Sea, resulting in US government measures against Beijing. The territorial disputes in the South China Sea could result in an armed conflict given its importance in three major settings: location, strategic resources, and military advantages. As for location, the cargo ships crossing the South China Sea carry one third of the world’s trade. With regard to strategic resources, there is a wide range of products such as oil and gas. Last but not least, the country controlling this maritime route will bear military advantages because it will hold access to Asia. With a mutual defense treaty, the U.S military presence would be more relevant in the South China Sea through the support of the Philippine government. The military alliance between the two countries was reinforced four years ago after the signature of a defense agreement, which consists of the establishment of five military bases in the Philippines . According to this agreement, the American military forces will carry out regular operations together with the Philippine troops to face any external threats. Hence, military installations represent a threat to peace in Asia because American ships are constantly navigating around the South China Sea. The closeness of the Philippines to the South China Sea and their military bases would therefore allow the American fleet to have a permanent presence in Asia. This increasing presence would obviously entail the response of the Chinese government, which might protect its maritime boundaries with a deployment of troops. It is worth remembering that the previous government took a case to a United Nations court to recognize its sovereignty over the Spratly islands, which were in turn also claimed by the Chinese government . The UN tribunal ruled that the islands belong to the Philippines, but the Chinese government did not recognise this decision, arguing that the ruling was unconstitutional in accordance with international law. This decision was also considered unconstitutional by Chinese media, owing to the fact that the tribunal was not entitled to rule over the property of the islands . The Chinese government made it clear that the court had no jurisdiction over the territorial sovereignty of China. On the other hand, the Philippine government decision went against their compromise reached during the summits of the Association of Southeast Asian Nations (ASEAN), looking to resolve the territorial disputes through negotiations with Chinese officials. Since the new Philippine government took office last year, not only did the president Rodrigo Duterte reject the UN decision, but he also refused Donald Trump’s recent offer to be a mediator in the territorial disputes in the South China Sea . 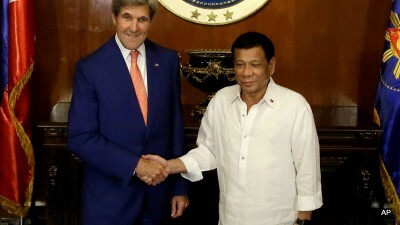 However, the new posture of Duterte’s government has not translated into a resolution of the territorial disputes with China in the negotiations between the two countries. Moreover, the Philippine president reaffirmed, during Trump’s trip to Asia, the commitment to carrying out the building of military bases last November. As a matter of fact, the building of the first military base has already begun in spite of the fact that the military agreement is unconstitutional for not having the Senate approval. Likewise, the U.S military assistance to the Philippines has increased significantly for the last ten years. In this sense, it has increased by four times during the period 2011-2017 . This destructive arsenal, which includes firearms and high-end equipment for air and maritime operations, was given to fight against terrorism and drug trafficking, according to the U.S embassy in the Philippines. Yet, the war against terrorism and drug trafficking has provoked 12,000 deaths of Philippines during Duterte’s government . Philippine police has been blamed by the population for committing several crimes against its people, pointing out responsibilities. Furthermore, the government has prosecuted activists, journalists and human rights defenders who dared to criticize the government’s strategy to eradicate terrorism and drug trafficking. In addition, the president Duterte has not addressed the sources of violence caused by horrible living conditions in the Philippines where the poverty rate was over 25 % last year. In this scenario, child work is the symbol of unfair labor practices in many places such as plantations, mines, and factories where many children are undermining their professional future . These practices surged as a result of American colonialism that has imposed brutal forms of exploitation on the majority of the population. In this context of violence and extreme poverty, president Donald Trump said that the Rodrigo Duterte administration has done a “great job”, taking into account the complexity of problems in Philippines . Therefore, the US has become supportive of this government, which needs military support to repress social movements. In return, the Philippine government would allow the US to stay in the South China Sea. In doing so, the Philippine government will destabilize the “One Belt one Road” initiative proposed by Chinese president Xi Jinping . According to the initiative, the starting point will be the Chinese city of Chongqing, then it will reach the South China Sea and the Indian Ocean and finally it will end in Africa and Europe. To finalize the infrastructure projects that hold the initiative, not only are Chinese representatives negotiating with Asian governments, but also they established dialogue forums in the ASEAN. The maritime route has great geopolitical importance for Chinese infrastructure projects in Asia. On the one hand, Chinese products will be carried through transportation lines to be sold in European markets. Secondly, South Asian countries’ products (Singapore, Malaysia, Thailand and Vietnam, among other countries) will be brought to the coast of Asia. Ultimately, the route will link the China–Pakistan Economic Corridor to the Bangladesh-China-India-Myanmar Corridor, which will improve the standard of living of the majority of inhabitants. Across the route, the Chinese government plans to make a significant investment to exploit maritime resources mainly through mariculture, to support transportation with the building of seaports and to bolster tourism by improving public services. These projects will benefit other important initiatives, for instance railways, industrial parks, and economic cooperation zones, which are related to the establishment of seaports, safe maritime routes, and the prevention of natural disasters. Nonetheless, the most important barrier to carry out these projects has been the inability of Asian governments to resolve the territorial disputes in the South China Sea, a situation that has been aggravated by the actions of the Philippine government. It is now when the cooperation among Asian countries is necessary so that the US do not undermine the efforts to support productive integration in Asia. This article was originally published on Alai. Ulises Noyola Rodríguez is a collaborator of Global Research. Reuters, Philippines says U.S. military to upgrade bases, defense deal intact, January 26, 2018. BBC, South China Sea: Philippines and Beijing await court ruling, July 12, 2016. The Telegraph, South China Sea ruling: why the China-Philippines court case matters, July 12, 2016. Global Times, S.China Sea doesn’t need outside ‘help’, November 13, 2017. U.S Defense Department, Congressional Budget Justification, 2017. Human Rights Watch, Philippines’ Duterte Confesses to ‘Drug War’ Slaughter, September 18, 2018.
 International Labour Organisation, Child labour in the Philippines, 2016. Reuters, Philippines say Trump recognized ‘great job’ Duterte is doing, May 2, 2017. Xinhua, Vision for Maritime Cooperation under the Belt and Road Initiative, June 20, 2017.